The clock is ticking down the time until Thursday's "Brexit" referendum, when U.K. voters will decide whether or not to remain in the European Union, with potentially far-reaching economic consequences. The possibility of the Brexit passing has been one of the biggest drivers here at home for U.S. stocks this week, as investors wring their hands over the possibility of a major shift in our seventh-largest trading partner, as well as a potentially dramatic devaluation of the British pound if the Brexit vote passes. At this point, the odds still look pretty evenly split. It's anyone's guess which side wins the vote. And as heavily as the Brexit is weighing on the broad market right now, the effects are being felt even stronger in U.K.-based companies this week -- and many of them are traded here in the U.S. For the most part, U.K. companies listed stateside are large multinationals -- and some are British in name only. But none of that changes the fact that any stocks with British domiciles and big revenue exposure to Eurozone markets are going to be hugely impacted by the Brexit vote, one way or the other. To make heads or tails of how U.K. stocks are likely to move, we're turning to the charts this week for a technical look. While we looked at five British stocks that look bullish yesterday, the fact of the matter is that the price trajectories of U.K. companies are about as split as the Brexit vote right now. So today, we're taking a closer look at five U.K.-based companies that look like sells from a technical standpoint. Regardless of which way the voting turns out, these are companies based across the pond that are teetering on the edge of big potential sell signals. So without further ado, let's take a look at five Brexit stocks to sell. Leading off our list of potential Brexit sells is London-based pharmaceutical giant AstraZeneca (AZN - Get Report) . Not only is AstraZeneca based in Britain, but it also has significant exposure to the Brexit, with about a quarter of the firm's sales coming from greater Europe. And after kicking off 2016 with a 15.6% selloff, AstraZeneca is signaling the potential for a second leg lower this summer. AstraZeneca is currently forming a descending triangle pattern, a bearish continuation pattern that's formed by a horizontal support level down below shares, and downtrending resistance to the topside. Basically, as this big pharma stock bounces in between those two price levels on the chart, shares have been getting squeezed closer and closer to a breakdown through our support range between $27 and $27.75. The presence of a support range, rather than a single discrete price level, makes AstraZeneca's price setup a little less than textbook -- but it doesn't change the trading implications here. 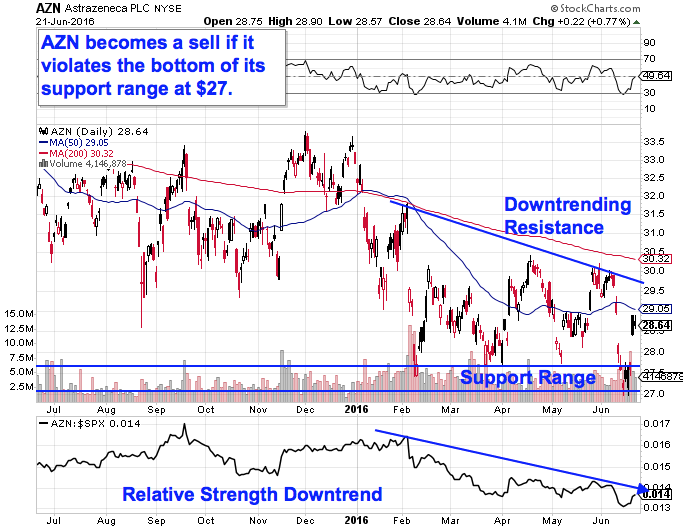 If AstraZeneca violates $27.75, consider it a caution flag -- and shares signal a sell if $27 gets broken. There's an extra red flag showing up on AstraZeneca's chart: It's relative strength, an indicator that measures this stock's price performance versus the rest of the stock market. AZN's relative strength line has been in a downtrend since early this year, signaling that this stock is continuing to underperform the rest of the market long-term. $27 is the line in the sand that, if crossed, triggers a sell. It probably doesn't come as a huge surprise that AstraZeneca peer GlaxoSmithKline (GSK - Get Report) is also showing some cracks in 2016. The thing is, from a performance standpoint, GSK couldn't look much more different from AstraZeneca. This $102 billion London-based pharma company has actually shown gains this year, handing investors total returns approaching 8% so far. But GSK's rally is beginning to show some cracks this summer. In fact, it's been showing cracks for a little while now. Back at the start of June, GlaxoSmithKline made my list of toxic stocks, before rolling over and losing almost 7% of its market value in the week that followed. And while shares have rebounded since, investors should look at that recent up-move with some skepticism. That's because GlaxoSmithKline violated key support at $41.50 when it broke down initially, triggering a double top pattern. And while shares have pulled back, they haven't been able to catch a meaningful bid above that $41.50 level since, an indication that there's still a glut of selling pressure up at that level. Pullbacks like the one we're seeing in GSK aren't uncommon after down-moves, but more often than not, they signal more downside risk ahead. 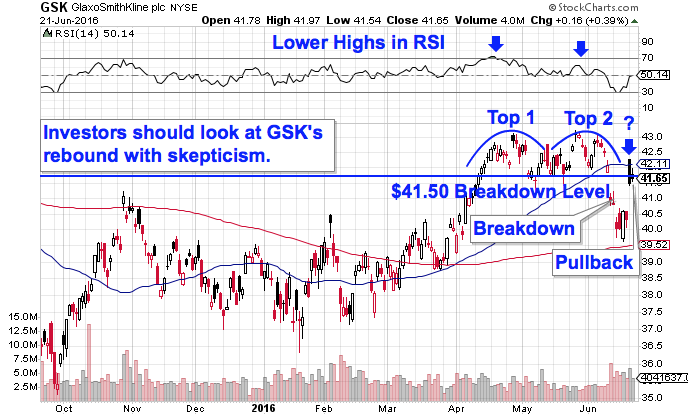 Until GSK is able to catch a bid above the top of the double-top pattern at $43, it's best to avoid this stock. $67 billion telco BT Group (BT is about as British as they get. This London-based stock generated four-fifths of its total revenues in the U.K. last year, which means that it's going to feel a significant impact from the results of the Brexit vote. But while the Brexit implications may be quite complicated, the price action in BT aren't. In fact, this chart is just about as simple as they get. BT Group has spent the better part of the last year in a downtrending channel, a price range that's corralled 99% of this stock's swings since last fall. Put simply, every test of the top of the channel so far has provided shareholders with an optimal selling opportunity before the subsequent move lower -- and there's no reason to think that this stock is going to act any differently this time around as it begins to move back up toward trendline resistance again in June. The next bounce lower is the sell signal in BT. Everything changes if and when this stock is finally able to move up above its price channel again. To simplify things, the 200-day moving average is the level to watch for BT bulls. 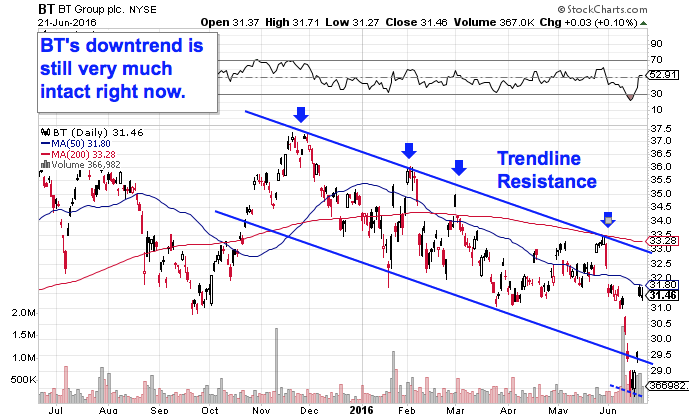 The 200-day recently intercepted BT's downtrend, which means that the bearish channel is in effect until this stock can cross above the 200-day. Cruise ship operator Carnival (CUK is dual-listed; American Depositary Receipts of the British arm of the company trade on the NYSE under the CUK symbol, while the U.S. shares trade under (CCL - Get Report) . Either way, though, Carnival has substantial exposure to the Brexit, not only through its substantial U.K. operations headquartered at Southampton, but also because of the fact that the firm generated a third of its revenues in the Eurozone last year. Like with BT Group, the price action is pretty easy to figure out in Carnival. 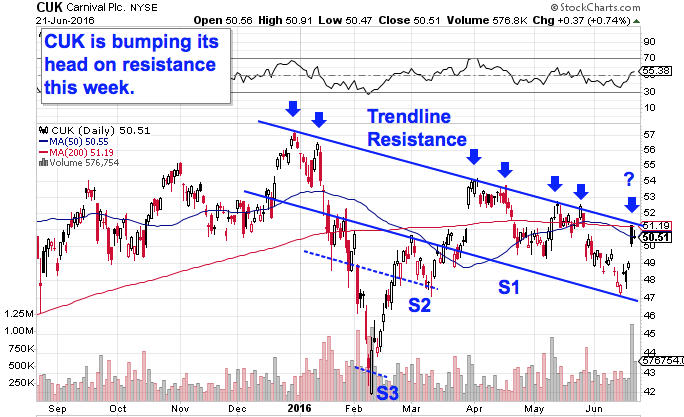 This stock has been in a downtrend of its own since the final days of 2015, bouncing lower on every test of resistance. The downtrend in Carnival has been less of a "channel" than in BT's case, simply because support hasn't been as solid of a technical level as resistance in 2016 -- but that's precisely why investors should take a cautious view of Carnival this week as shares bump their head on resistance for the seventh time. While CUK's price ceiling has been inviolate this year, shares have met with little in the way of buying pressure on the way down. From here, the next bounce lower is the sell signal to watch for in Carnival. Waiting for a bounce lower before clicking "sell" is a critical part of risk management for two big reasons: it's the spot where prices are the highest within the channel, and alternatively it's the spot where you'll get the first indication that the downtrend is ending. Remember, all trend lines do eventually break, but by actually waiting for the bounce to happen first, you're confirming that sellers are still in control before you unload shares of CUK. Last up on our list of bearish British trades is $1.6 billion Langley, U.K.-based travel platform provider Travelport Worldwide (TVPT - Get Report) . Travelport has been all over the place in 2016, selling off hard to start the year, only to reverse course and rebound hard starting in mid-February. But zoom out on the chart a bit, and Travelport's recent gains look very much in jeopardy. 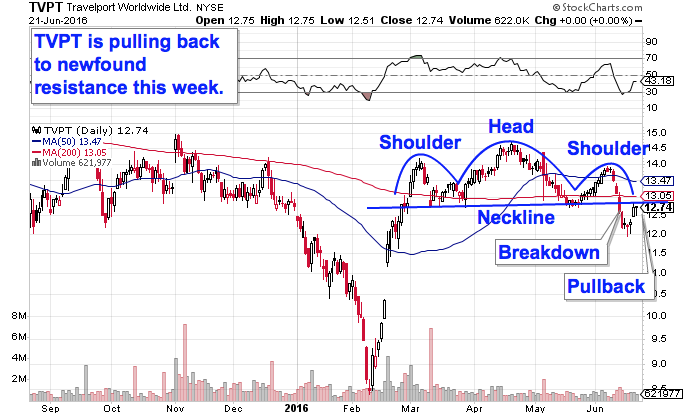 Travelport has spent the last few months forming a head and shoulders top, a bearish reversal setup that signals exhaustion among buyers. The setup is formed by two swing highs that top out at approximately the same level (the shoulders), separated by a higher high (the head). The sell signal came on last week's move through Travelport's neckline at the $12.75 level. Now shares are pulling back to re-test their newfound resistance level at $12.75. Typically, pullbacks like the one in Travelport (and the one we looked at earlier in GlaxoSmithKline) give shareholders a second chance to sell before a more substantial move lower. Because of the size of Travelport's up-move back in February, this stock is devoid of any meaningful support levels between where shares sit now and prior lows just below $8.75. Caveat emptor.